By now you probably know about the Big Tex Choice Awards’ winners and ten finalists at the 2018 State Fair of Texas. But there are a few more unique foods and beverages available at the fair, most of them only found once a year. Corn Dog Ale is an amber ale brewed with a blend of Pale 2-Row barleys, caramel malt, and smoked malt. We add a proprietary blend of eight herbs and spices to the brew kettle. The combination of subtle smokiness and spices evoke the flavor and aroma of a classic, delicious corn dog. Orange Julia’s Beermosa starts with champagne that is flavored with orange Pixy Stix, Blue Moon® beer, and vanilla ice cream. The creamy frozen cocktail is served in a Pixy Stix®-rimmed cup with a large Pixy Stix plastic straw. Supra Stuffed Mini Sopapillas are filled with strawberry cream cheese, dusted with cinnamon and sugar and drizzled with honey for a sweet finish. Fried Cup of Corn “Elotes” where traditional elotes meets sweet southern corn in a flaky pastry. The creamy texture of blended seasonings and Mexican cheeses is spooned into a flaky pastry and fried to golden perfection. 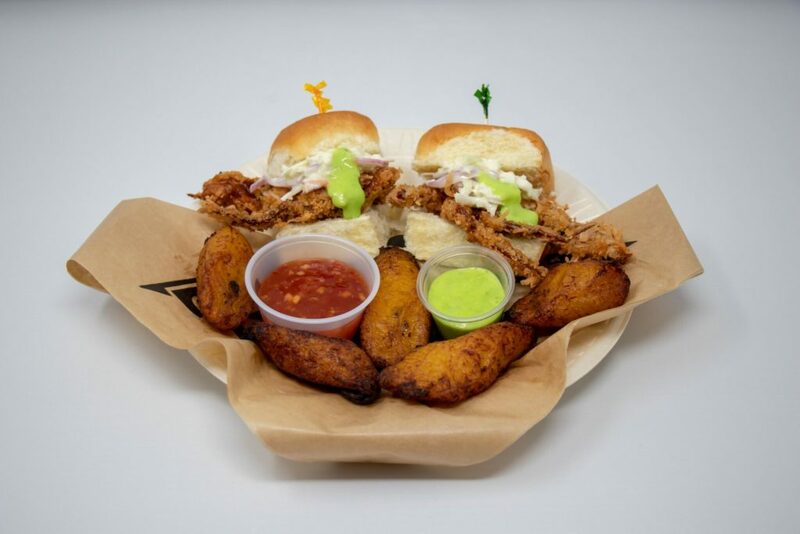 King Crispy Coconut Crab Sliders: Softshell crabs are dipped in coconut batter and fried, then perched on a King’s Hawaiian bun. Dressed with Asian slaw with a hint of wasabi and served with fried plantains, spicy Asian mustard, and sweet/sour sauce for dipping. Texas Thai Delight: Sticky rice infused with coconut milk mixture, layered with mangos and more coconut mix, rolled in batter and deep fried for the perfect crunch. Served on a stick with a side of in-house sweet sauce. Frosty’s Frozen Hot Chocolate was my personal favorite. I wish they served this year round! 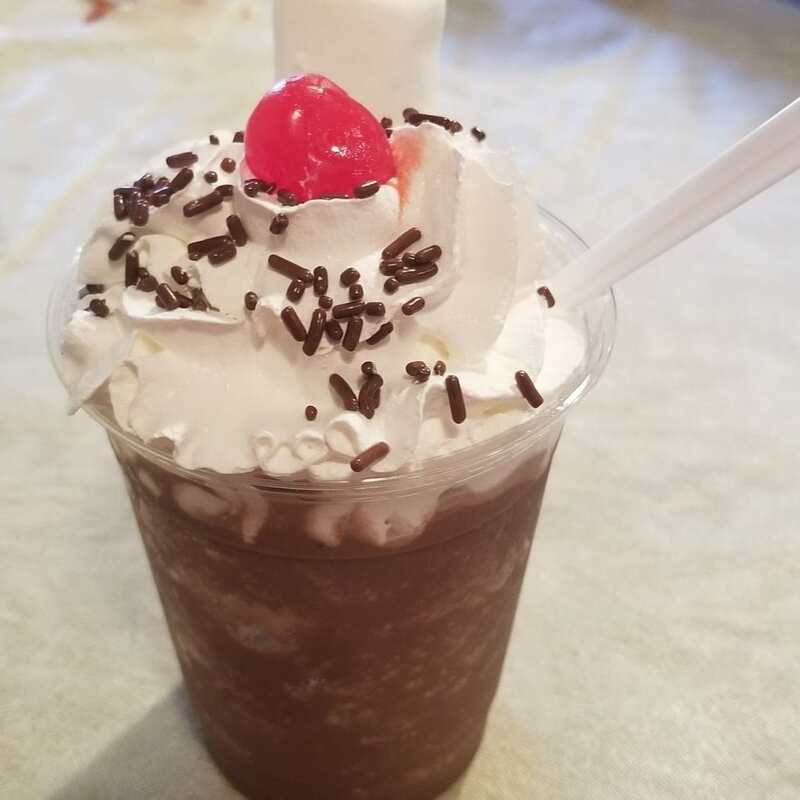 A combination of Ghirardelli® cocoa mixed with milk and water, then ice blended till “frosty.” It’s topped with whipped cream chocolate sprinkles, a marshmallow and cherry. We found ours on the Old Mill Inn’s patio. Pico Frito (Deep Fried Pico de Gallo): A zesty medley of tomatoes, cilantro, onions, and jalapenos are folded into an egg wrap paper and deep fried until crispy and golden. Each dish is served with a side of savory cilantro sauce. Kool-Aid® Pickle-Dilly Sangria is a perfect marriage of sweet, savory, and fun. It’s a delicious combination of sweet and salty with a fruity back-bone, infused with Fruit Punch-flavored Kool-Aid®. Laced with ripe pineapple, cherries, and blueberries, plus crisp white wine topped off with lemon-lime soda. Southern Fried Chicken Nachos offers a blend of cheese, Ro-tel® tomatoes, and pico de gallo on tortilla chips. Topped with southern fried chicken tenders and garnished with fresh cilantro. Fruity Dessert Nachos starts with a bed of crispy butter cookies, smothered in fresh strawberries, blueberries, and bananas. Drizzled with a classic crème anglaise and rich, smooth Ghirardelli chocolate sauce and whipped cream. Bacon brittle is a glorious splendor of southern classics incepted from a family recipe for brittle. Thick cut applewood smoked bacon is flavored with a hint of bourbon for a sweet, salty flavor and crunchy texture from the brittle. Cherish Erbert Champagne: Pixy Stix® cherry sherbet champagne is sipped through a large Pixy Stix® straw with powdered candy around the rim. A champagne bubble burst with sweet and sour cherry flavor and just the right amount of vanilla ice cream make a refreshing frozen cocktail. No matter how many new foods are introduced at the State Fair of Texas, the perennial favorite is still Fletcher’s Corny Dogs. The lines seem to grow longer each time we visit. There’s a new “dog” this year, Fletcher’s Cheezy Pup. Soft American cheese on a stick is dipped in Fletcher’s batter and deep fried to a golden brown. My husband and I try to sample as many of the new foods plus old favorites during our frequent fair visits. But there’s only one week left so we will have to pick up the pace, we’ve only tried a few of the newer offerings. The State Fair of Texas closes October 21, and your ticket to the fair includes free shows, concerts, activities and exhibits. There’s a great exhibit showcasing innovations in the Hall of State. Another favorite stop for us is the Jane Douglas DAR House. 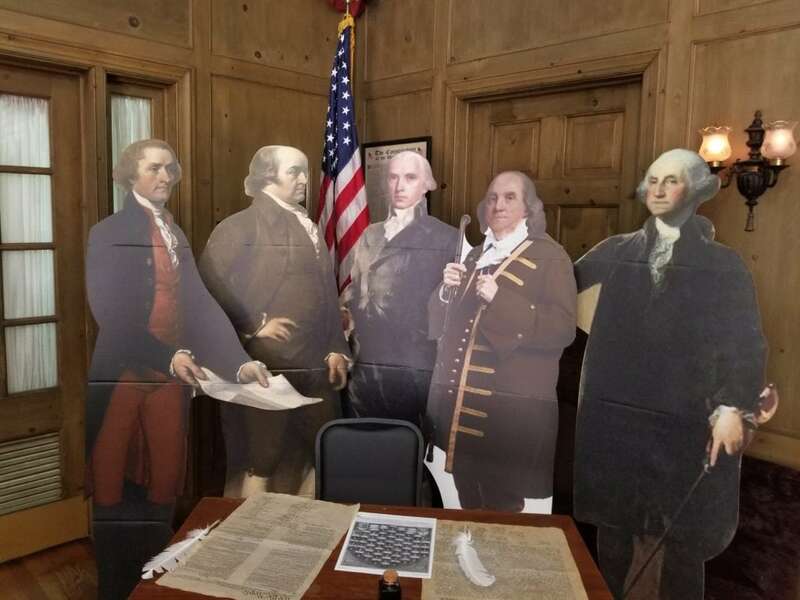 They always have interesting historic exhibits, friendly (sometimes costumed) greeters, and cold bottled water, sodas and Snicker bars for $1 each. You’ll need coupons to try most of the foods at the fair. The coupons don’t expire, I used some from three years ago this year. You’ll also need coupons for rides or games of chance on the Midway. Pick up a copy of the Visitor’s Guide when you get to Fair Park, and look for special coupon offerings along with daily schedule. The guide also lists where to find all the different foods and beverages. Thrifty Thursday is the best day to sample a variety of foods, plus senior citizens get in free that day. There are a few places where you can pay by cash or credit during the fair. The Old Mill Inn (where they also have a full bar) doesn’t require coupons. Your cash is also good at the DAR House and at the Texas Store, where they showcase products made in Texas. Since its inception in 1886, the State Fair of Texas has celebrated all things Texan by promoting agriculture, education, and community involvement through quality entertainment in a family-friendly environment. The State Fair of Texas is a 501(c)(3) nonprofit organization with all proceeds helping to preserve and improve Fair Park; underwrite museum, community, and scholarship programs for inner-city youth and students pursuing agricultural careers; and help improve State Fair operations. Visit BigTex.com for more information.